When you want to drive a full-sized wagon that will keep you comfortable and happy during trips of any distance, don't look further than the 2018 Ford Transit. 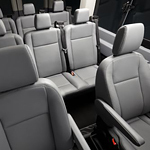 Regardless of the number of passengers you're transporting, everyone will appreciate the high-roof and spacious cabin. With an best-in-class interior height of 77 inches, everyone will fit comfortably. You'll be able to choose between 10-, 12-, and 15-passenger models so that you can transport groups of any size. For added storage, the Ford Transit comes with overhead storage bins that will help you keep your small items organized. You'll be able to reach for whatever you need easily, and the items will remain secure during transport. At Ford of West Covina, we can help you choose the perfect Ford Transit model for your driving needs. We believe everyone should be comfortable when driving and will explain the differences between the models.